more plentiful in the cooler, northern waters of the Pacific. The higher north, the better the crabbing. The best time to catch Dungeness crab is when the water is quite calm. In between high tide and low tide will give you the best chance of landing some crab. There is approximately a 2hr window of really good crabbing in between tides. This is when the bay currents are very still. Dungeness crabs are looking to feast on your baited traps at this time when the water is not moving. Check your local tide charts and get out there early so your traps are baited and ready for when the water starts to settle. If you are out in the ocean trying to catch Dungeness crab, be aware that currents can move really fast out there. You will need to add some weight to your pots to keep them still or you will not bring up any crab. An extra 10 or 15 pounds should keep them well on the ocean floor. You want to keep your pots in the water for 2-3 hours before pulling them up. Some people leave them in for a longer period of time and have better luck. Make sure there is plenty of bait and that the bait is protected with some type of bait holder so hungry seals don't steal your bait. Crabbers prefer catching Dungeness crab by boat. That is not to say that catching crab from a pier or from the shore is not possible. By boat you are able to cover a larger range if you try dropping pots in different areas. Whether you are catching crab from a boat or pier, be sure to check your local laws to see if you need a license, the size and number of crab you can keep, and also which devices (traps and line) are legal to use. 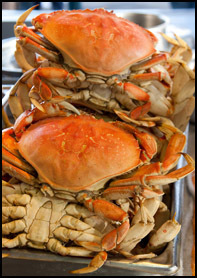 For a list of areas to catch Dungeness Crab, check out the Dungeness Crab Hot Spots section.